After the Ordered Universe workshop on the De iride, Cecilia Panti and Giles Gasper will be delivering a talk to the Durham Institute of Advanced Study Seminar, as part of that Institute’s annual theme focused on Light. As a contribution to a seminars series on the History and Future of Artificial Light organised by Dr Chris Dent in the School of Engineering and Computer Science, they will be talking on: ‘Artificial light in the Middle Ages: a Diversity of Applications’. 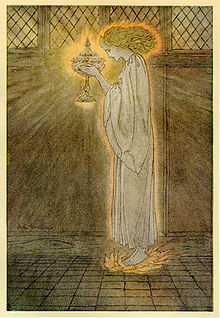 Giles will talk about candles and glass, and the notion of artificial light; Cecilia about mirrors and lamps. Theophilus Presbyter, the Holy Grail, Roger Bacon and Albert the Great will all feature: as of course, will Robert Grosseteste, if only in passing! The talk will take place at 1.00 pm next Wednesday (5th March) in the Institute of Advanced Study, Seminar Room (on Palace Green). to book this, stating any special dietary requirements, by 0900 on Monday 3rd. There is no need to book for the seminar itself.